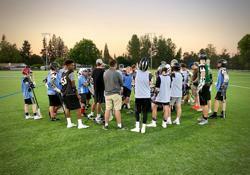 Mountainside Lacrosse (MSL) is a non-profit organization dedicated to supporting lacrosse in the catchment area of Moutainside High School in Beaverton, Oregon. Our mission is to provide financial and organizational support, and to grow the sport of lacrosse in our catchment area. We are an integrated program providing lacrosse for both girls and boys from Kindergarten through to 12th Grade. We are looking to expand our support at the youth levels this year. Please let us know if you're interested in coaching at any of the following levels - Girls 3/4 & 5/6, Boys 3/4. No lacrosse experience is necessary, just enthusiasm and a desire to help grow the game. Trendy coaching apparel will be provided. Email us if you're interested. ©2019 Mountainside Lacrosse / SportsEngine. All Rights Reserved.